We are going to wind things back a little today as we have a new visitor with us. So I want to look at the first field of mindfulness, the body. It is good and healthy to take things back to the start sometimes and it reminds us of the things that actually are staring us in the face. Listen to the audio or read the text. So let’s take a look at this body connection. Firstly, though, to get to grips with this we also need to see and feel the mind/body connection. It is clear that our bodies exist in and of themselves but without our minds we would not be aware of them. It is our mind that goes in to our bodies, with awareness, and explores it. But, where do we actually feel our emotions? Next time you experience an emotion, and you could probably find one right now, where do you feel it? You don’t feel it in your head do you? You feel it in your body. It’s in our gut or heart space. So the mind does the thinking about the situation but it is in the body that we experience it. So the body and mind are very much connected. Now, this give us something that is exceptional. It gives us the ability to connect deeply with the world around us. Our first level of connection is through the five senses. Let’s take, for example, smell. The chemical enters the nose, triggers the sense of smell. But of course what happens next is that it touches the mind, because it is the mind that interprets the smell. It places meaning on it and it also applies all our previous experience that we associate with that smell. We may then, of course, find emotions triggering through. So now we have a real vehicle to explore through mindfulness. 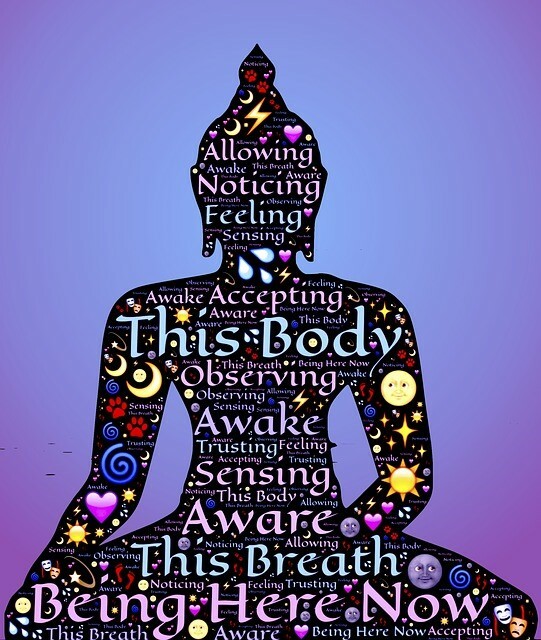 By paying attention to our bodies we can start to feel the emotions as they fire up and we can then look around ourselves and see what may have triggered them. Practising like this, we often find that our interpretation of the emotions we are carrying around in our selves are actually wrong. We feel an emotion and it starts to drive our behaviour and we blame the emotion on some aspect of our lives, but it could be something entirely different. The classic example of this was the monk walking through New York who suddenly felt anger. Confused by this but mindful, he stopped and looked around him. He spotted a man on the other side of the street. Someone he didn’t know but who had a similar body shape and walking gait to someone who had wronged him before. This is a very good example of this process going on. If we aren’t mindful, we become angry but don’t even realise it has arisen. Then, something insignificant but slightly annoying turns up and we attach our anger to this thing. Perhaps someone accidentally nudges us. Then, we have a reason and an excuse for the anger and they get both barrels. So, by starting to pay attention, more, to the body, we start to become aware of the subtlety of the emotions within us and how the world around us is triggering them. We can also practise with the emotions and their effect on the body directly. This is all about learning to soften. Emotions tend to have a common effect on the body. Tension. Many emotions result in tension in the gut and the heart space. This tightening, if not let go of, will cause us physical difficulty eventually. Hypertension, high blood pressure, heart problems. All of these can arise if we don’t ever let go of this tension. Of course this isn’t easy. I’m suggesting here that we learn to pay attention all the time, even when we are in the thick of life. But that’s what we need to do. The meditation is the key here. When we are meditation what we are actually doing is developing habit. A habit of watching the body and watching the mind. Because it becomes habit, then the body watching and the mind watching will happen automatically (to an extent and with practice) so that we start to experience how the world around is triggering what happens inside the body. And this is the magic. As things happen in the world around us, reactions and emotions arise in the body. With practice, this starts to blur the dividing line between us and the world around us.